Not unlike the fan-favorite collaborations from the world of craft brewing, premium cigars have shared a similar aura of ingenuity and care for craft over the past decade. This is the mindset behind our latest collaboration — one that combines old world traditions and refinement with a modern touch. Indeed, Cigar Dojo, Quesada Cigars, and Smoke Inn — each innovators in their respective categories of the industry — have partnered to introduce a rare and exquisite treat for the seasoned cigar enthusiast. Introducing Dojo de Luxe by Quesada Cigars, a project that showcases the critically acclaimed personal blend of Master Blender Manuel (Manolo) Quesada in its most luxurious format to date. The end result is Dojo de Luxe, drawing from limited edition and shop exclusive releases often found with Cuban Habanos. The cigar uses Manolo’s personal blend of Dominican fillers and binder, wrapped in a buttery smooth, Ecuadorian Connecticut wrapper — which has been tweaked to best showcase the cigar’s intricate shape. It is 5¾” x 52, rolled in a classic perfecto vitola. The smoking experience is medium in body, offering refined complexity as its focal point. An astonishingly perfect construction gives way to creamy flavors of buttered toast, salted crackers, light citrus, raw sugar, and subtleties of black pepper. As you may expect, a cigar of this caliber cannot be produced in large scale. 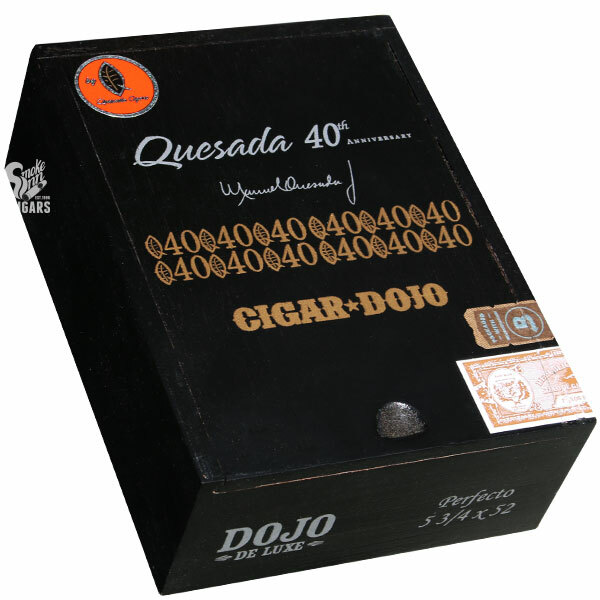 We have secured enough tobaccos to produce only 500 boxes of 10 cigars, which showcase a collectible display of Cigar Dojo and Quesada artwork on each sub-band and slide-lid box. Order NOW while supplies last!